Pita gyro at the new downtown hot-spot Hoocut. Skewers, gyros or mince kebab? Gourmet or traditional? Whatever your preferences, here are the best places to get Greece's famous fast food in Athens. Truth be told, there is a “best souvlaki” spot in just about every neighborhood and town in Greece. Everyone has their personal favorite, and to be completely honest, the place I usually get mine – which I love – isn’t even on this list. There are that many great options. 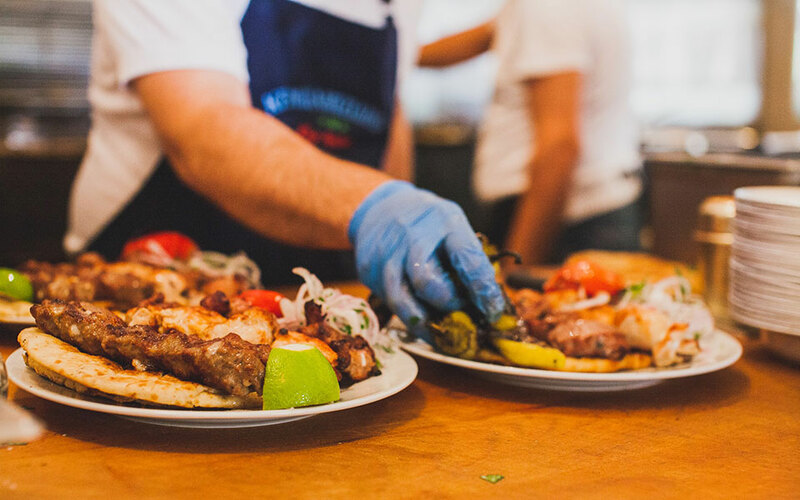 Making a list of the best souvlaki restaurants in Athens isn’t something one takes on without second thought. It’s controversial, and is likely to cause a debate and draw angry reactions from a certain type of passionate non-foodie-food-lovers (you know who you are, you cheeseburger-pizza video sharers), who would gladly name pita gyros as their drug of choice. So to soften the blow a bit, this isn’t a list of the best souvlaki restaurants in the city, but rather some of the most standout ones in 8 different categories. 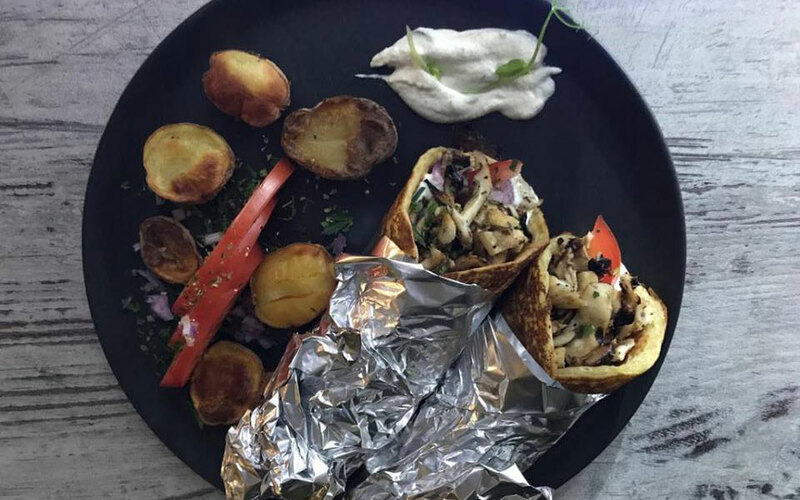 Traditionally, souvlaki can consist of three different types of meat, which is wrapped in (or served with) pita bread with veggies, often fries, and tzatziki or some other sauce. Kalamakia means skewers – pork or chicken cooked on skewers on the grill. Kebab is minced meat with spices cooked on skewers. 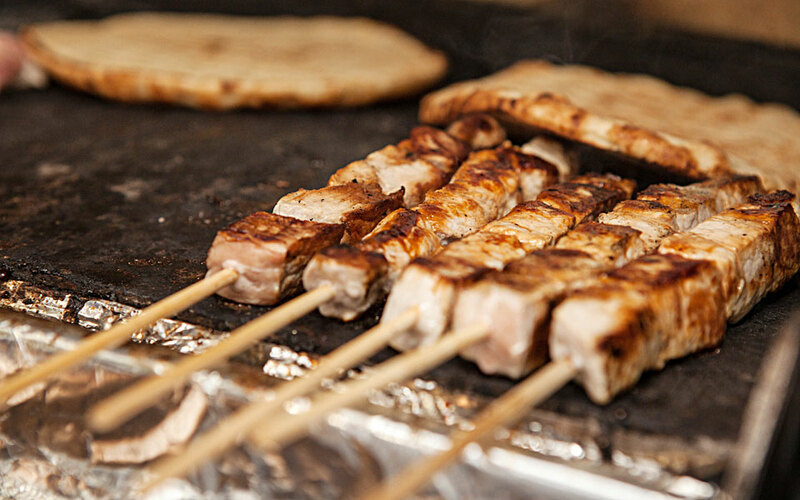 Gyros is not doner, but cuts of chicken or pork cooked on a vertical rotisserie. If you are new to the city, and have yet to find your favorite neighborhood souvlaki dealer, one of these are sure to satisfy your cravings (or be the one to get you hooked). Note: Souvlaki in Greece is cheap. Really cheap, as in about €2 on average for a wrap and €1,50 for a skewer. Some of these restaurants have slightly higher prices than the average – which we think is actually quite fair given that what you are getting for the price is better quality ingredients. Speaking of hooks, the name of this new restaurant is a combination of the words hook and cut – butcher shop words used to describe a souvlaki restaurant that isn’t like the others. Here, the open kitchen resembles four separate shops: a bakery, where two kinds of pita bread (one for wraps and one for portions) is made fresh, a greengrocers, a butcher’s shop, and a grill house. The restaurant, which is the creation of five famous Greek chefs, opened just a week ago, yet it seems as though everyone we know has either tried it out or is planning a visit. Rarely has a souvlaki place gotten so much attention. The reason? 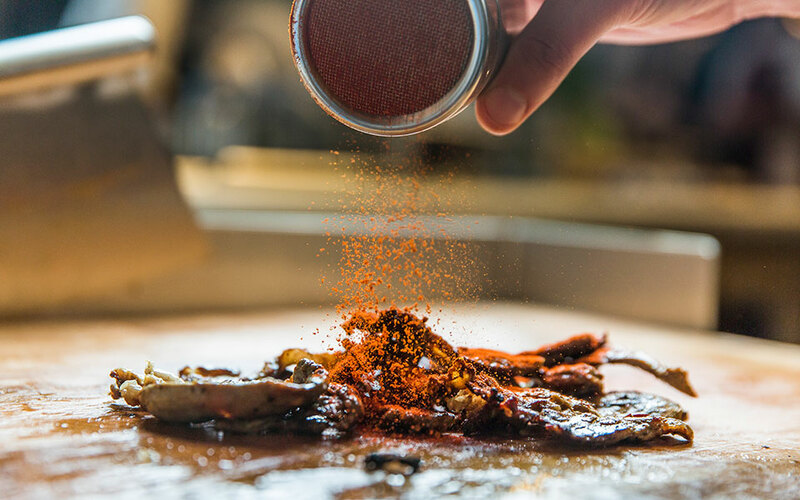 Hoocut uses only top-quality ingredients, sourced through distributors with whom the owners have long-standing relationships with thanks to their other restaurants. 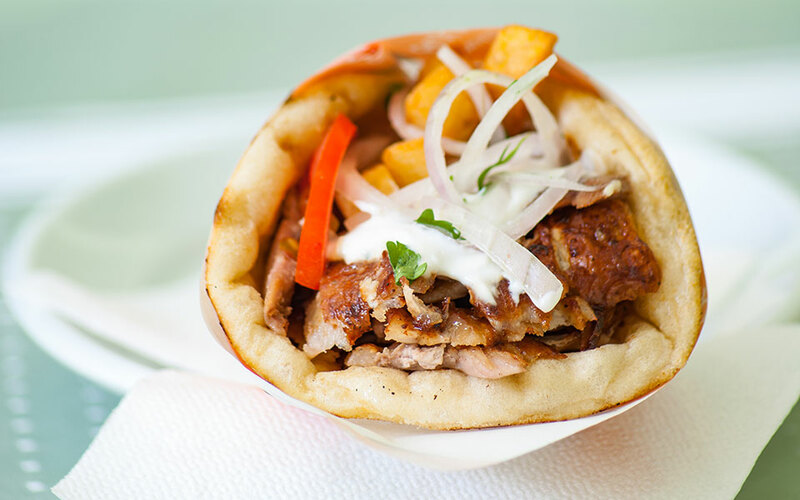 Their gyros is made with excellent cuts of meat, free from the fatty parts and full of flavor. It’s not carved off a vertical rotisserie as is customary, but sliced very thinly and then briefly grilled before being cut up with a large mezzaluna knife. Aside from the classic chicken and pork options, there is also beef and, our favorite, mutton. The wraps are small, and prices are slightly higher than most, but if you’re looking for fresh, quality souvlaki with less grease and clean flavors, this is it. Our favorite since forever, this fast food joint is as traditional as they come. The shop is a point of reference for many Athenians, and has been around since 1950. For most of that time, it occupied a tiny location in Plaka. 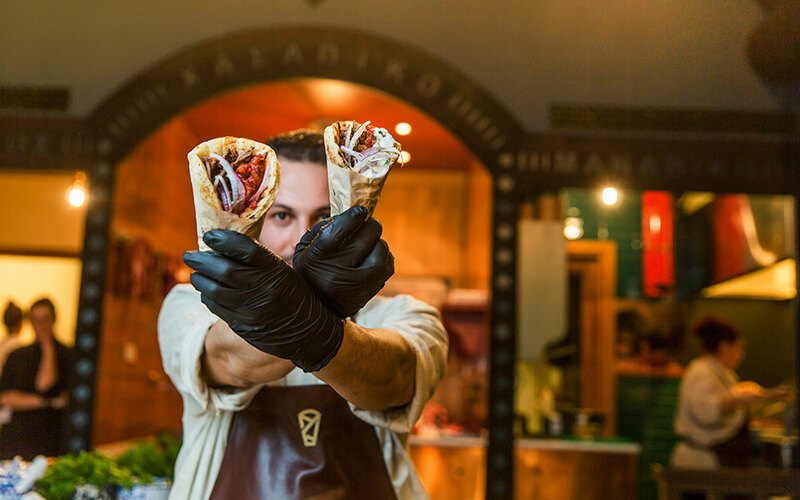 Today, owner Kostas Lavidas, who is the grandson of the restaurant’s namesake and founder, makes their famous souvlaki in a just slightly bigger shop near Syntagma Square. Beware, this place is strictly for lunch as they usually run out of souvlaki by about 15.00. For your evening cravings, you must find a second favorite. Proving that gyros truly is for everyone, at Lime Bistro you can get a pita with mushrooms so close in flavor to freshly carved pork gyros that some vegans might hesitate for a moment before devouring it. The secret is in Demmy Georgiou’s lemony marinade. The sauce is vegan tzatziki made with almond yogurt, and the pita bread, which is baked fresh daily, is made from chickpea flour and almost sweet in flavor. It’s a combination to die for, and yet no being has died for it (except the mushrooms, I suppose). Lime Bistro is not actually a souvlaki place, but a vegan restaurant serving a mix of street food and traditional Greek dishes, and their gyros is not on the menu. However, they do make it every day. Given that everything from the pita to yogurt is made from scratch, and vegan ingredients are more expensive than those that go into your regular souvlaki (which is kind of crazy when you think about it, but that’s how it is), it is little surprise that these wraps come in at the high end pricewise. Two large wraps or a gyros portion will come to €13,80. 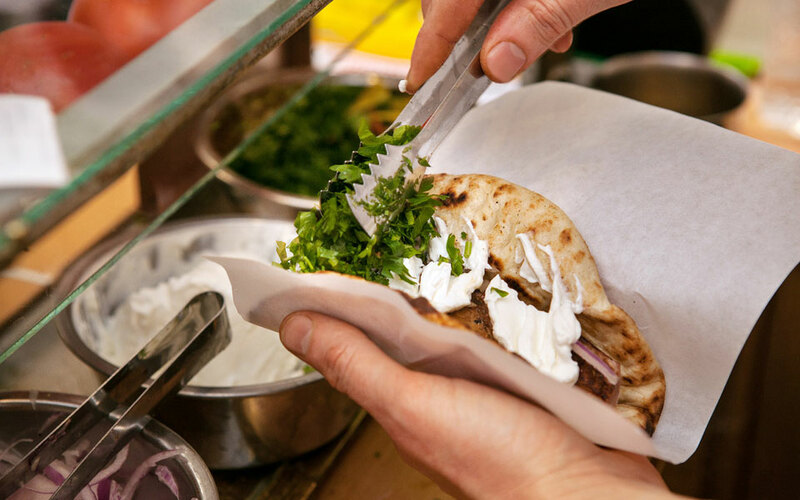 It’s a step removed from the ‘fast food for the masses’ ethos of your classic souvlaki, but we still think its worth it. Mushroom gyros is unexpectedly delicious. Celebrities and tourists mingle at this hot spot in Monastiraki square. It is nearly impossible to visit central Athens and not at least catch a hunger-pang-inducing whiff of grilling meat from Thanasis. The restaurant enjoys a location that is almost too good to be true, and pretty much everyone either knows of it, or has stumbled across it as they come out of Monastiraki station. It’s a good place to people watch, but if you prefer to get away from the hustle and bustle of the square, you can obviously get it to go. The best thing to order here is a wrap with mince kebab and all the fixings. If you want to sit and there is no table, you can either settle for the restaurant right next door (Bairaktaris), which features the same – if not better – people watching opportunities, or take your wrap and find a spot in the square. For some of the best pork and chicken skewers in the city, choose Elvis in Kerameikos, or at their newly opened second location in Pangrati. It is one of those places everybody knows, partly because of its location – and the fact that it stay open late, making it the perfect option after some barhopping in Gazi. But this isn’t the type of guilty pleasure that you enjoy when you’ve been drinking, but then recall with horror the next day. In fact, you’ll likely feel the urge to return under more sober conditions at the first opportunity. There are no wraps here, but excellent skewers (kalamakia in Greek) and crispy fries. Have a seat at one of the stools if you can find one (there are more seating options at the new place in Pangrati), and enjoy your meal with a cold beer. Skewers ready to be wrapped in pita bread at Kostas, near Syntagma Square. This list would simply not be complete without one of the typical neighborhood favorites. It doesn’t look like anything special, is mostly frequented by people living on the block, but those who know it rarely accept eating a wrap from anywhere else. The name of this plain-looking restaurant literally translates to “everything on the coals”, and it perfectly describes the food they serve. Once they get your order, everything – your pita, the meat base (gyros or skewer) and veggies are grilled together, before they wrap everything up. If that sounds like the making of the greasy kind of souvlaki served at most of these little neighborhood takeout places, think again. Eating here means less grease, and more flavor. To find your way here without a GPS, ask people for directions to “ta koritsia” (the girls), the nickname given to the place as it’s operated solely by women – an uncommon sight in the male-dominated world of souvlaki. In Paleo Faliro, Kir Aristos has basically taken over a street called Sintagmatarchou Zisimopoulou. They have a pasta restaurant, a deli, a fish restaurant, and, of course, a souvlaki restaurant. While that might sound a bit commercial, there is nothing cookie-cutter about this place. In fact, it’s a pleasant and cozy restaurant with pop-on-your-tongue flavors. The only thing that would resemble a regular souvlaki joint is the small open kitchen area, except that it is usually hidden behind the mountain of takeaway containers they go through every day. They also have a large outdoor space with more tables, which is heated in the winter. Favorites here are the perfectly seasoned kebab, and for something a little different: the pita with pastourma (pungent, spiced, cured beef). Since the meat here is full of powerful flavor in itself, you can easily leave out the tzatziki. Ask for yogurt instead. Every neighborhood in Athens has one souvlaki place which has its own signature (usually tomato) sauce, and people get their wraps from them when they need a break from their regular order. Those who do it best make their sauce spicy. Kafteros means spicy, and if you order the red sauce here, the name will make perfect sense. This restaurant, which first made a name for itself back in the 70s, looks like one of the regular nondescript neighborhood takeout places. Nothing in the décor or on the menu lets you know that Kafteros is special. However, if you ask the patrons where they’re from, you’ll find they’ve come from all over Athens specifically to have their guilty pleasure meal here. And what does that meal consist of exactly? Kebab is the most popular choice of protein. Get it in a wrap or served with tomatoes on top of small pita breads, with the spicy red sauce on the side. Of course, if you prefer, there’s also chicken and pork. The sauce however, is non-negotiable.